Too often people give up physical activity as they age. Whether it’s achy joints or a lack of time, there are too many reasons people feel like they don’t have time to stay in shape. Tennis is no exception. People see pro tennis players gliding back and forth across the court and think that they’re too old for that. This is not true! In fact, tennis is a fantastic sport to play at any age especially as you get older. One of the reasons many people get started playing tennis is because they know it’s a game they can play the rest of their life. A lot of older people are worried about getting injured or aggravating a preexisting injury when starting a new sport or physical activity. Tennis is one of the safest sports out there, and a perfect fit for all fitness levels. That said, tennis injuries can happen. These may include a twisted ankle, tennis elbow, or wrist pain. Whether it’s an acute injury, or long-term pain do not wait to treat it! Hopefully you won’t get injured playing tennis, but you should always be prepared. In general, you can help prevent injuries by staying in great shape. This may include doing regular agility drills, yoga, weight lifting, or even just walking. You’ll have to tailor your workout routine to any preexisting health conditions and your current fitness level. Injuries occur often because the body is not equipped to take on new physical stress, so you must adequately prepare your body beforehand. Additionally, you should warm-up before any match. When your muscles are cold, you put yourself at greater risk of injury during a match. A warm-up routine should include head to toe exercises including stretching, jumping jacks, arm circles to name a few examples. Rallying back and forth with a partner is important to not just for your technique, but to acclimate to running back and forth on the court. Diet is so important for so many reasons. It determines our weight, our energy levels and even things like joint and bone health that many of us don’t think about. If you’re going to be an active tennis player, you must make sure to have a healthy, balanced diet to provide enough energy, but not cause fat gain. Additionally, you always want to stay hydrated—both on and off the court. A lot of 40+ players may be scratching their head at where to find players. Definitely keep an eye on your local league as we hope to running 40+ leagues in most cities by 2017. 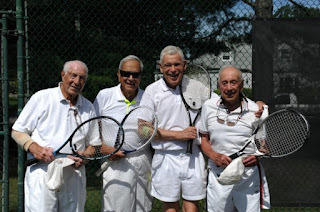 Instead of looking to join an expensive tennis club, check out the Tennis League Network’s …to check out the competition in your area.